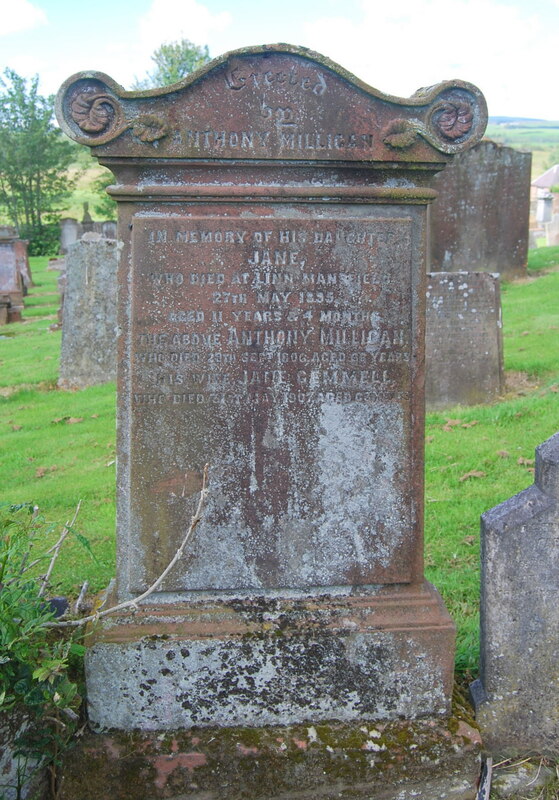 George Milligan and his wife Elizabeth Park lived at Pathhead, New Cumnock and had 8 children, According to their headstone, three children died in infancy. George was a coal-carter, possibly working at Pathhead mine owned by Archibald Gray & Co.
Anthony Milligan married Jean Gemmell on 3rd July 1863 at Dalmellington. Their eldest child Betty was born at Pathhead, at which time Anthony worked as an agricultural labourer. The family moved to Sanquhar where five more children were born to work at Brandleys farm near the banks of the Glendyne burn. Anthony continued to work as a farm servant before becoming a coachman. The family moved back to New Cumnock and in the 1891 census records we find Anthony, Jean and children Hugh, Mary and Jane at Lower or Nether Linn, on the lands on Mansfield. The cottage took its name from the waterfall on the nearby Mansfield Burn, the Scots word for waterfall is linn. Further up the burn is another cottage called High Linn. Anthony continued to work as a coachman and now worked for Lady Jane Stuart-Menteth, who lived at the beautiful Mansfield House. The Stuart-Menteth’s were Baronets of Mansfield & Closeburn and had developed the abundant coal and limestone deposits on their Mansfield estate and greatly improved the quality of the farm land. Anthony would spend much of his day at the Mansfield stables where his son Hugh alsow worked as a groom, looking after the horses. Lady Jane was one of the leading land-owners in the parish and one of Anthony’s duties would include taking Lady Jane by coach along the Mansfield road to church and back. Anthony passed away in 1906 at the home of his daughter Bessie and her husband John Lees, shoemaker. Their house still stands in the Castle and is named “Glendyne” in memory of the Milligan family’s time at Sanquhar.